When we were first installed in our new home at the Ark back in July last year, and with the skeleton of a functioning kitchen (electricity, work surface, storage, running water), we carried on doing what we knew best from our pop-up days; hosting coffee mornings. We were good at that; we knew what we were doing with the urn, filter coffee machine, and toaster. Once we had been donated the espresso machine, we started experimenting with fancy coffees (and with huge and ongoing thanks to Dark Woods Coffee for continuing to donate their beautiful coffee beans to us). In around October last year, we received a very generous donation from local company, Engage. With it, we bought an oven. This opened up a whole host of opportunities for us; we started warming up the pastries we picked up from Sainsburys – to overwhelmingly positive feedback from our guests – and then, feeling brave, we took the plunge and started offering a lunch time menu. At the beginning, we played it safe; it was jacket potatoes, cheese on toast, salad. Then Ray began experimenting with the veg and brought in tasty soups (we use a plug-in soup warmer). Then some pizzas arrived and we used the oven for them. This was starting to feel like a real, bona fide, put-us-on-the-food-map, cafe. February saw another donation from Engage, and with it, we bought and installed a gas hob. No stopping us now! A new wave of volunteers started to join us. And they wanted to show us their cooking skills. 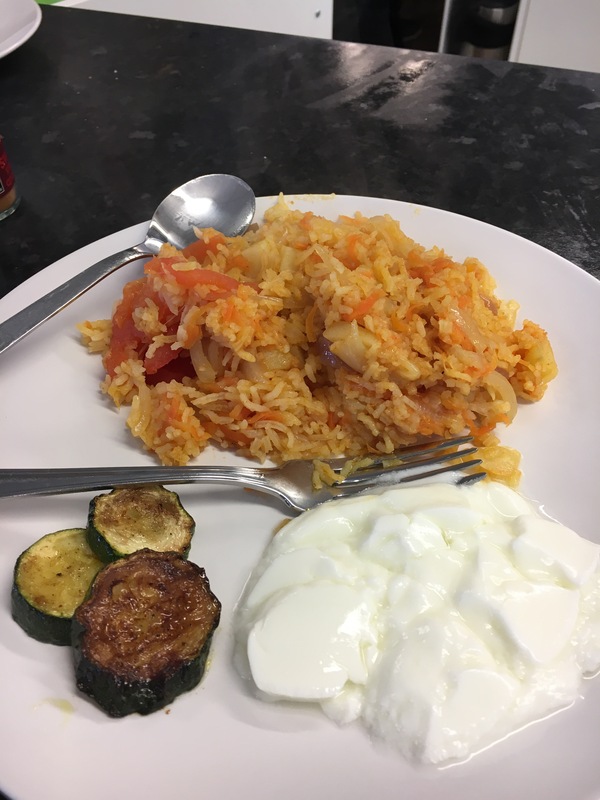 Suddenly, the lunch menu was getting more adventurous and international in flavour; curries, superfood salads, Indian street food, Iranian omelettes, rice dishes, potato dishes. Each day we’re open, it’s a delight to see what delicious dishes are created out of the food that we have picked up that was destined for landfill. Today, very rarely, we were short on volunteers, so I rolled my sleeves up, and panicked about what was going to be on the lunch menu. We had a sparse variety of vegetables but a big box of cherry tomatoes, some bags of pre-cut vegetables for a casserole mix, no potatoes (dammit! ), a drawer full of spices, rice. I won’t bore you with my failed home attempts at making rice that just ended up with white burnt mush in a pan that can’t be coaxed out for love nor money – I dreaded the day when I’d have to make rice in the cafe, and thought that maybe today was just going to be that day. But I would put it off for as long as possible in the hope for some miracle to occur. Vegetable casserole and rice it was going to have to be then. As I was getting the equipment ready, two local regular Pakistani ladies turned up. I asked their opinion. Maybe I could make a vegetable curry. But, I know my limits, and being a nice Jewish girl from North London, the thought of making a curry for an audience of Pakistani women who can make the most amazing curries with their eyes closed was daunting to say the least. They gave me a few tips, encouraged me, and then left. I was kind of hoping they’d offer to make it for me, but no such luck. I rubbed out the ‘casserole’ on the chalkboard and replaced it with ‘curry’, took a big gulp, and started chopping. I extracted the onions from the mixed vegetable bag mix, and cut it up small. I added them to a pan with oil in it, and then added a big dose of medium masala spice mix. I threw in the cherry tomatoes , and left them to cook and make the thick rich sauce that I was promised by my two friends. Distracted by customers, and coffee, the bottom of the pan began to burn. Dammit! I added some water just to stop this happening again. The smell was amazing but the pot just didn’t look the part. It was not turning into the curry base that I had seen and enjoyed so many times before, made by others. Oh dear. I panicked. I took another pot and threw the last bags of casserole mixed veg into it, thinking I’d make a hearty veg soup with it. I wrote that up on the chalkboard. The curry still wasn’t looking right, and the new pan of mixed veg wasn’t looking or smelling good either – I think the swedes were just the wrong side of ‘alright to cook with’. More customers. Oh dear God please help me. And the answer to my prayers arrived. She walked in, in her bright pink (my favourite colour!) sari, calm and collected. I pleaded with her to save the curry. She took over. She added some spices. She tasted it, added some salt, worked her magic on the sauce to miraculously turn it into the thick tomato curry base I was praying for, added the aubergines (I had prepared them correctly, at least!) and finally we had a dish worthy of putting on the lunch menu. I rubbed out ‘vegetable’ and wrote ‘tomato and aubergine’. It was delicious. My prayers were answered and ToastLoveCoffee lived to see another day of it’s magic in the kitchen. If you were panicking you hid it well! And no one but you knew about the burning. Lovely, heart warming account. As a ps though, I have to say that I have been the recipient of many, delicious Anna made soups. See you on Tuesday. Lovely, Anna! Ever thought of writing up each day’s recipes on the board ( or perhaps just one recipe) alongside the menu? A bit like Riverford’s recipe with each box? You could help everyone expand their culinary skills that way…..